This is a post in the Interfaith Ramadan series. Articles written by contributors from diverse faiths and none will published every day throughout the month of Ramadan. I'm delighted to share one of the loves of my life with you today. It may not make headlines across the globe, unless you've been reading about the recent discovery of King Richard III's skeleton, but I've got a huge soft spot for Leicester, an unassuming city in the middle of the UK. Even though I only spent three years there as a student, it made such an impact on me that I've referred to it proudly as my adopted home town ever since. I am a British Muslim, mother of two and firm believer in Interfaith relations. Since being involved in this field for the last three years I have myself deepened my understanding of Islam. I have been working as a women’s outreach worker for the Christian Muslim Forum for the past year in Leicester (See video: Leicester Women of Faith Directory). The Forum provides a platform for both Christian’s and Muslim’s to come together and develop dialogue, friendship and discuss sensitive issues at the heart of both religions. 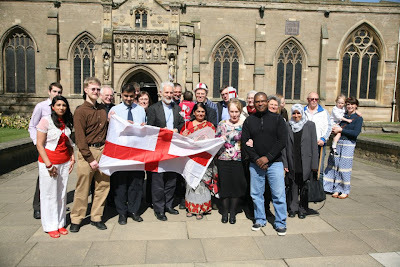 The Forum (www.christianmuslimforum.org.uk) has many ongoing initiatives across the country that engage both religious leaders as well as lay people. The Forum has grown in strength through its public activities but also in the online arena with very active Facebook group and speedy tweeting. People of all Faiths get involved in the work of the Forum, only last week a Hindu lady thanked me for inviting her to the reclaiming of the St. Georges Flag, this event on St. Georges day was to really highlight the fact St. George should be a figure of national unity and pride and that we were demanding him back from groups that promote racism and extremism. We wanted to stand up against the hijacking of a national hero by those who promote Islamophobia, anti-Semitism and other forms of discrimination. My more recent work has been with women, connecting women in a community can have great impact. For the past six months I have been producing an online directory of groups, services and projects available for Women of Faith in Leicestershire. I have thoroughly enjoyed being involved in this initiative, I have met such beautiful women who give so much to their communities most of the time in a voluntary capacity, when their work goes unnoticed they continue to strive tackling some of the issues at the core of communities which can also go under the radar. We want our women to have a voice as innovators, change makers and nurturers. At a recent launch of the directory we had 80 participants, inspirational speakers both male and female who spoke about taboo issues such as women in places of worship and domestic violence. The Muslim Christian Women’s Network is working with other such groups across our region sharing good practice and inviting people new to interfaith to dip their toes and meet like-minded bubbly women who most of all share food, friendship and faith. This Ramadhan has been surprisingly easy for me (Alhumdulillah/Praise be to God) I guess running around after 2 children, working, and praying doesn’t leave much time for the thought of food. Although fasting for Muslims is not about staying hungry more so it is about becoming closer to our Creator, and Lord. It is a time for reflecting, prayer, and taking action to help those who are less fortunate than us. Allah knows all my actions and I will be held accountable for my actions so having concern for rights of all of the creation of Allah is also key. There have been so many Islamaphobic and terrorist incidents that have happened across the UK since Woolwich (May God raise you to a lofty place in Heaven Lee Rigby) I feel really privileged to have been born and brought up in Leicester. Leicester is a real beacon for Interfaith harmony and a great city of diversity and culture. The people in Leicester are committed to building relationships and increasing peace and friendship in our city. So far this Ramadhan I have attended 5 interfaith Iftars, the first was in a local church with young people from the Leicester Interfaith Youth Hub who hosted members of the church congregation to share Iftar and spread the message of love and peace between faiths. Three were held in a mosque who invited local residents of all faiths to share this annual iftar. It has been great to meet new people while at some of the Iftars. I was sat with an 82 year old woman Rose at a Shi’a mosque, the programme included a theatrical peace on the revelations of three prophets, Mosses, Jesus, and Muhammed (peace be upon them) after the performances there was an interactive quiz from the scriptures. Myself and Rose were discussing answers and both of us were increasing our understanding of each others faith as well as sharing some very common ground. She was a lovely lady who had genuinely come to support her neighbours and represent her church congregation. My last Interfaith Iftari was hosted by a Multi Faith Organisation and an Umbrella Muslim Organisation. The Bishop of Leicester, who was a speaker at the event, spoke about the continued need for our faith communities to continue to engage with one other without needing an excuse to, or without a significant event at home or abroad being the reason for engagement. There are only a few days left of this blessed month, a special guest which has increased the love in my heart for Allah, All the Prophets (peace be upon them) and my family. I pray for all of mankind to Allah that he may bestow his mercy and compassion and increase their sustenance. I thank Allah for all that he has given me and continues to give to me. Links of the Day: Some Leicester Love! Sheikh Ibrahim Mogra is a well respected figure within the local community and in the wider context of the UK in his role as the Assistant Secretary General of the Muslim Council of Britain. Many Muslim women will already be familiar with my second Leicester connection - Amena Khan. Amena, also known as Amenakin, is a content creator on youtube and runs her own online hijab and clothing store called Pearl Daisy. She also has a boutique in Leicester itself. It's true that leicester is very diverse, though south Asian heavy. Being the only Asian person in certain university classes was a new thing for me! I feel most people get on nicely though I would be interested to hear what the 'native' Brits feel as well. Hi! I wish we heard more about Leicester really - none of my Italian students have ever heard of it. I had the opposite experience to you actually (because I wasn't Muslim back in my uni days) - going from the predominantly white campus into the city centre where there's a large South Asian vibe. I absolutely love Leicester - event though (and perhaps because) it isn't a touristy city. It's just really nice to live in. Forget Italy, people in London have hardly heard of the place! It's a decent city but I do prefer London due to a feeling of greater vibrancy.